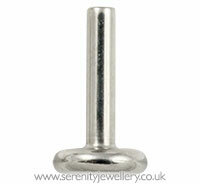 Hypoallergenic internally threaded titanium labret post. Internally threaded jewellery and accessories aren't as interchangeable as externally threaded jewellery (where only the gauge needs to be the same). Due to slight differences in the threads the thread types need to match as well as the gauges. To make this simpler we've named these type A, B, C and D. So for example a type A accessory will fit a type A post, but a type A and B will not fit together even if they are both the same gauge. Great to be able to but individual posts! It would be great of the gems were also sold separately so you could change the gem/post to suit the piercing!